Sorry I've been a bit inactive lately. This week has been crazy stressful. I had sorority recruitment practice "work week" and the first week of school. Im still getting in the hang of college life, so these next few weeks will be a bit tricky with scheduling since im so super busy! Since I havent published a lot of posts lately check out my latest odyssey article, the 7 people you see on quad day. And for those of you who like to keep busy check out my guest post on Gina Elyse about how to get a job on campus! so thank you for being forgiving during this transition. Hopefully I will have a new schedule down soon. I have tons of great post ideas and will work super hard on giving you the best content I can. Remember that im Co-hosting the Autmn swap! Sign up by Friday! Its going to be great! This Post is part of the Back to School Challenge. Learn more here. Its wednesday and I have Officially been on campus for 3 days. School doesn't start until Monday, and although it feels like summer, School is upon us, and my "summer" is over. 3. All the extra time! I didn't work at all this summer, and although I wish I was able to get a job I was really able to focus on my blog and hanging out with my friends. I read a few books which was nice. and had time to watch tons of TV shows. (all of American Horror Story, Bates Motel, Baby Mama, and Orange is the New Black.) When School starts im not going to have any time for just chilling. So I miss the relaxation that is summer. This summer I reconnected with some of my high school friends and grew really close with some my boyfriend's friend group. I'm really going to miss going to Taco Bell at 1 am in the back of a pick up truck and gabbing about sorority stuff while DIYing with my friend Emily, Setting off fireworks with my pyromaniac friend Tyler, playing night games, going to campfires, and shopping with my high school friend Kelly. I'm not going to see any of them until we go home for break so I'm going to definitely miss them. Even though I only live 3 hours away from my school, It's still too far for me to come home and visit regularly. When I'm at home I get to hang out with my sister and dad and this summer we made a Tuesday movie night tradition. Every Tuesday, when the theater is only $5 a person, we go to the theater and see a movie that came out that week. My dad and I are big movie people, and there's usually something that my sister wants to see. It's super fun, and a way for us to all hang out despite whats going on that day. What do you guys miss about summer? Comment Below! Since I am not yet the legal age of 21, And until a few months ago I wasnt bar legal, so i have a very limited knowledge of different cocktails. (or even Mock tails) so im going to do a little rating system of the drinks I have tasted. So I havent had these since I was 15, But I remeber liking them, once, After the first sip its a bit too creamy and sweet for my taste. Although I would have to try it again to be accurate. I give it 3 stars. I've had these with my parents before. I prefer things blended but they're on the rocks people. Its okay. 2.5 stars because they're okay depending on the situation. At a Mexican restaurant or themed parties, Sure. But It's not my go to. It's a little too lime-y for me. but with the salt its yummy. I like these a lot more the the plain Margarita. Th strawberry and lime is the perfect amount of sourness. and I like the texture of the blended drink. But I haven't had this in years so I would have to taste again. Yes! Pina Colada's are great. And I pretty much go out of the way to get them. Ive never had an alcoholic version, but the coconut and pineapple flavor is delicious. The virgin version I got at a beach bar a while ago was great. It's good but nothing fancy. and Kind of scary how you cant taste any alcohol in it. but they're tasty and easy so i decided to include it. Those are the only fancy drinks I've ever drank. Sorry I"m not more experienced lol. #stillababy. I Just moved back into school yesterday, and am starting to fall back into the Fall spirit. Fall Is my favorite season, I love the crisp air and the new beginning that comes with the back to school season. 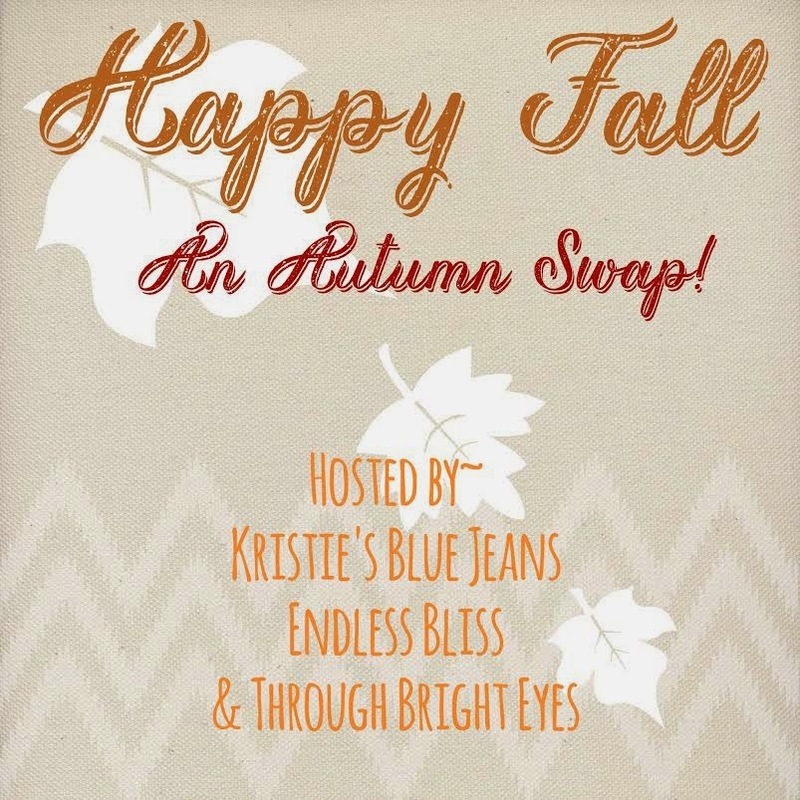 Since I love the Fall season so much I've partnered with Kristen and Tiffany to set up an Autumn themed swap. If you've never participated in a swap before it's a great way to meet new people! and end up with some goodies in the mail. The swap opens today and will be open until the 29th. We will provide you with a partner by the 30th. Read the Fine print below for more details and be sure to follow all our blogs! Price range is $15-30 on this one. Get your partner something nice! contact your partner for a more specific price point. So what are you waiting for? Sign upHere! At this time, this swap is only open to USA bloggers as I am not experienced enough to do an international swap. Be sure to followKristie's Blue Jeans, Endless Bliss and Through Bright Eyes in addition to your partner's blog. Signups will run August 18th through August 29th and the pairs email will be sent August 30th. You are responsible to contact your partner within 48 hours of the swap email. Get to know your partner's likes and dislikes of the season. Trade addresses to mail your packages. You agree to purchase gift(s) in the dollar range of $15 to $30, you and your partner can decide on a specific dollar amount. All packages must be mailed by September 15th so your partner gets them in time for the first of Fall. September 22nd the link up will go live and be open for one week (September 29th). Please be sure to grab the button and link back up. Are you ready to be a swapper- fill in your info here. ** Disclaimer, Kristieâs Blue Jeans, Endless Bliss and Through Bright Eyes are only responsible for matching the swap partners. We are not responsible for packages that are not delivered. Please notify us immediately if you do not hear from your partner within 48 hours of the email being sent so we can make arrangements for your participation. Happy Swapping. This will become a seasonal swap. I hope to see yâall for the Winter/Christmas swap! Ive Been in Marco Island Florida this week! and went stand up paddle boarding with my sister! I'm the one on the Green board. On my way back to school now though. Shark week provided us with this gem. Considering doing an Ad of the week, This Shark week advertisement is one of the best things Ive seen all summer. Its just the best thing ever. It's sad that one of my favorite shows is over (and I haven't even seen the last season yet! (come on netflix!) but it will be great having How I Met Your Mother joining Full House and Friends on Nick at Night and watching the re-runs. Its just awesome. Crazy. but so emotional. Re Read Becoming Chloe by Catherine Hyde. It is still one of my absolute Favorite books. I might just do a post just for that book. Literally go buy it right now. It will change the way you look at the world. Read about it here on Goodreads. Buy it on amazon, Rent it from your library, borrow my copy, I dont care how you get it, just read it! Only saying because I had to print out photos for my sorority. (I move in tomorrow) and was able to print out 30 4x6 for like $4. Use the Code GREATPRINT50 at Check out. anyway that's pretty much everything that happened this week check out next week for more cool snipits. This Post is part of the Summer Blogging challenge, To see my other posts and learn more click here! Being a student at University of Illinois (Urbana-Champaign) There are many a parties I have been to. From sorority sleep overs to any theme you can think of, I've probably been there. To my friends and I going out, doesn't even mean just one party, an average day has at least 3 stops before the night ends. I decided to write this post on my 5 favorite types of College parties. Everyone's been to them, or at least seen them in any teen or college movie. It happens when you and your friends want to go out, so you text around and see where everyone's going. Get a feel of what parties are going on and then walk around Frat Park until you find a party. Sometimes you get a facebook invite. Sometimes your friend has a friend who's cousin is going to the apartment party of her best friends roommate. It doesn't really matter. These parties are pretty much an open invitation party. They can be fun, but it's mostly a lot of sticky floors and loud strangers. Can be fun if you go out with the right people but they get old really fast. Sorority Party with Costume themes. We each picked a couple and dressed up like them! Now themed parties are like random parties with a theme. From Toga to Highlighter these parties are fun to get ready for and unique costumes can be a good conversation starter. The pictures you take at them are fun and there is generally some themed activity. I once went to an around the world party where each room had a different drink to try. It was super creative and fun and you met a bunch of people in each room you entered. These are definitely a great experience, if only to say that you were there! Me and my Sisters on Pledge Mom night. Plaid theme! and sisters only! Meeting guys is fun, but there's nothing quite like a sisters-only party. You don't have to worry about random guys hitting on you, and you can spend the whole night getting to know your sisters more. Some of my favorite nights out are with my sisters. Me and my friends from the American Advertising Federation. (AAF) at a Barndance for AAF Members! My Pledge Family on Pledge Dad Night. When I say Invitation only, I mean more like a club party. Where everyone in a certain organization is invited, Like the people you work with or the people who are in the same club as you. They're supper fun because like Sorority Parties, there are no randos invited. Having a party with just work or club members is a great way to bond and get to know each other better. For an orginization that im in we decided to throw parties as a fundraiser and charge everyone who came $5. It was only for members and their friends, and some of my favorite memories from my first year of college were at those parties. Going out is fun but sometimes the best thing to do is hang out with your best friends. Rent a corny movie or pull out a board game and a bottle of wine, and just be with your best friends, doing what you do best. Whats your favorite party? Comment below! Check out the Autum Swap I'm Co-Hosting! This Swap was invented by Kristie at Kristie's Blue Jeans and is co-hosted by Myself and Tiffany at Endless Bliss! This swap opens Monday so check back for the form. Basically since the theme is Fall, you send your partner Fall themed things (Lotions, candles, back to school, etc. It's going to be super fun and who doesn't love getting packages in the mail? Sign ups go from Aug 18 to 29 so be sure to sign up! Read below for the terms and conditions. Florida and a Blog Re-design! Although I've only had this blog for 2 months it's already had 2 re-designs. Each time getting a little bit better. I have a lot to learn but I'm hopeful and persistent and have tons of other amazing bloggers that I'm looking up to. Let me know what you think about the new design. In case your new to my blog this is what it looked like before. I think this is a big improvement. So click through and let me know what you think! Right now I'm in Florida so I don't have as much time to blog right now but I will definitely do a few posts to fill you into my adventures as I start school and recruitment. Im going to be in Florida until Saturday then drive to U of I on sunday and drop me off at school where I will be living in the same clothing until my boyfriend and best friend can bring some of my things back to school. Until then heres some Florida pictures! These are all ones I took today. I'm not usually an outfit of the day person, but this is part of the summer blogger challenge so I'm giving in and doing it in order to complete the challenge. Today I went shopping with my High School Bestie Kelly and my sister Jenna, so i was dressed a bit better then I usually am. (I usually wear my pajamas all day or a plain tee with shorts. So here goes! also pleas appoligize for the cellphone quality pics. I am not a professional blogger yet! Most of my clothes are thrifted or sales, so Ill be putting the price next to the item just so you can see how thrifty I am! Skirt:This is from Nolly and your cant really tell from the picture but its all lacy. I love this skirt because it looks so great with black and a great twist from a traditional pencil skirt. I snagged it from a Pac Sun closing sale for only $3, and also own it in orange. Although I wear the green a lot more. Jacket: This is Karen Scott, and looking her up now I see that they sell her at Macy's. Not too bad. I got it at a salvation army for $4. Not too shabby. I've only worn it a few times but have so many jackets in this style but in different colors. This is the only one that pulls off the 3/4 sleeve rolled look though, which is great. Watch: Tommy Hilfigur purchased for my self from the Nordstrom Rack for $60. More then I would normally spend but I love it and haven't taken it off since I got it. Bangel: Used to be my mom's. I've been wearing it since I was 13. It's sterling silver, but other then that I know nothing about it. My sister bought this for me for Christmas. But i know she thrifted it and I think she got it for like $7 or something. The brand is JG Hook and its a pretty decent sized cross body. I also like the color so it gets to stay in my wardrobe. Shoes: American eagle but bought from Payless Shoes. New on clearance for $3. I have these shoes in 3 colors but this is the one I like the most. I share them with my sister because we couldn't decide what colors to buy. At night I just swapped the skirt for a pair of light wash high waisted shorts and went out with my friends. We usually get pretty adventurous so I don't like to wear skirts. So there you have it! What I wear on an average day! Do you guys like these kinds of posts? I can do more if anyone actually reads these/ likes them. Let me know! For this blogger spotlight I'm going to draw your attention to Tiffany from Endless Bliss who has agreed to do a button swap with me. You can find her button on my side bar, and links to all her social media buttons below! I personally love Tiffany's Blog, so check her out! I'm Tiffany Khyla, the voice behind Endless Bliss, a happy lifestyle blog that documents my transition from college life to corporate life. I believe that everyone deserves to live a happy life, and I like to share that positive outlook on my blog through my Motivated Mondays series where I try to start off the week with a motivating post. Endless Bliss also discusses my love for the following things: Harry Potter, being in love, traveling, crafting, my rescue puppy, and the beautiful life that I'm lucky to live.